Albany’s 6th Annual Ride of Silence was on Wednesday, May 16 starting at 6:00 PM and 6:30. 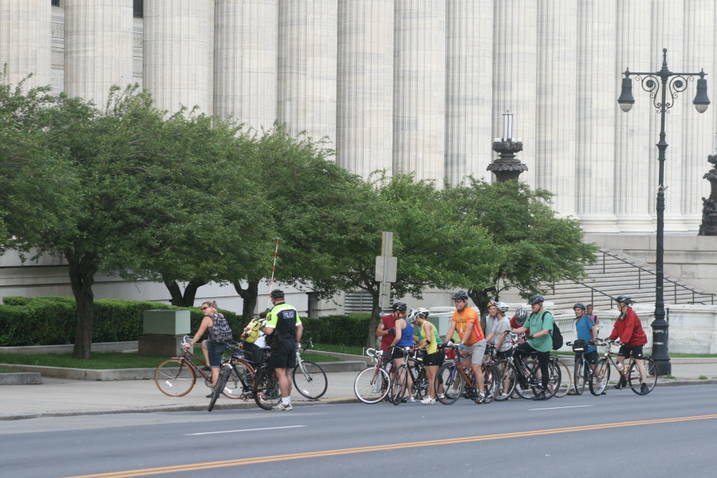 Cyclists gathered at Albany’s Corning Preserve/Boat Launch and at West Capital Park/NYS Education Building for a silent tribute to riders killed or injured while cycling on local roads. The 20 riders were accompanied by a bicycle police officer from the University at Albany. The slow-paced procession left the Corning Preserve/Boat Launch at 6:00 p.m. and then visited Jose Perez’s bicycle on Broadway at Quay St. The 12-mile round-trip route then met up with riders near the NYS Education Building and visited two more fatality sites. We finished up with two flat tires and a refreshing downpour as we cruised in town on Central Ave. The Ride of Silence, which is held during National Bike Month, reminds us all – cyclists and motorists – to be considerate on the road for the safety of all. The ride also shows respect for those who have been killed or injured while cycling. The first Ride of Silence was organized in 2003 to honor a Texas cyclist killed by a bus. Events are now held across the nation and in other countries, including Australia, Canada, and Scotland. For a list of locations and more on the history of the event, go to http://www.rideofsilence.org. Ride of Silence 2013 will be on May 15, 2013.